One of the more picturesque means of transportation that I can remember was going up the side of a mountain near Lugano, Switzerland on a gondola. It was silent except for the whirring sound of the machinery moving the gondolas. There was plenty of time to enjoy the changing view and I took lots of pictures. Although it was May when I had this adventure it was still chilly with traces of snow on the ground. Here is some of what I saw that day. 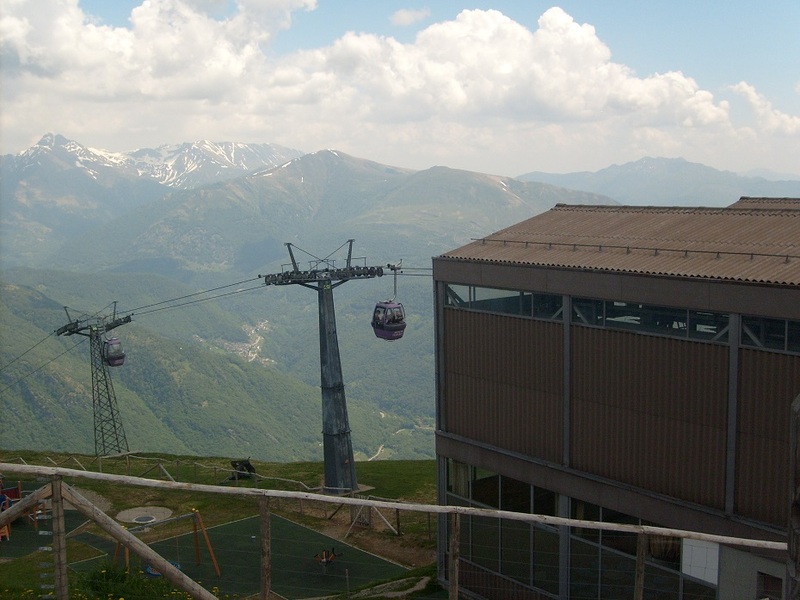 This entry was posted in Lugano, Switzerland, Travel and tagged Alps, gondola, mountains. Bookmark the permalink. Thanks – it was an amazing experience! Beautiful but scary if you’re driving the roads. I saw people going up the mountain on bicycles – that must have really been challenging! What lovely mountain tops! You’re really high up in that gondola. Wow. It was quite a long way from the ground so I just looked ahead and not down! We visited Lausanne and Geneva several years ago. These mountains scenes are gorgeous! I think that the mountain views in Switzerland are simply fantastic! They are some of the prettiest that I’ve ever seen! Fabulous, Meg! I love your ski lift series, and the fact that your photographs and narrative had me swaying right up there with you. Thank you Elisa. It was quite an experience and the gondola ride was just as exciting as the views from the top! Thank you so much – it was a day that I’ll always remember! Stunning views! What a wonderful adventure! I was really happy riding in a gondola and taking in that magnificent scenery! J’attends mes vacances d’été avec impatience à la vue de ce superbe panorama ! Merci! I hope that your summer vacation is wonderful! Gorgeous, Meg. Brings back memories of the time I spent working in Grindelwald, Switzerland in the mid-70’s, seeing the Eiger out my window every day. Ahhhhhhhhhhhhhh. The sound of those bells is one of my favorite memories of Switzerland! Your post is timely…we are preparing to take the Banff Gondola to the top of Sulphur Mountain. Beautiful photos. Thank you – your trip sounds wonderful and I’m looking forward to seeing your pictures!